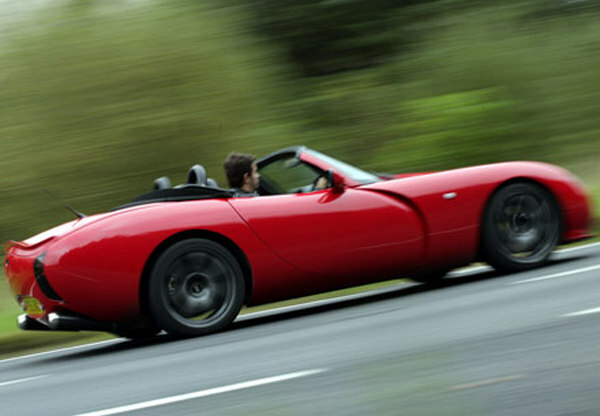 Buying a TVR has always been considered to be something of a gamble. Without the quality control systems and enormous research and development budgets of a global brand like BMW, the Blackpool-based marque has always relied on the passion it invokes in its fans to convince people to buy into the brand. It’s a passion that must run very deep in Russian millionaire Nikolai Smolenski: In July 2004, the 25-year-old took the ultimate gamble and bought the company outright. 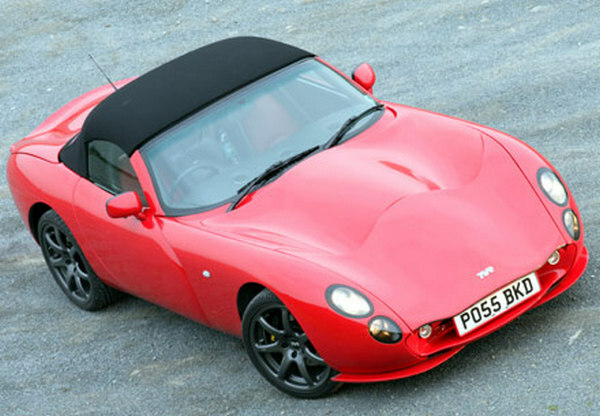 As predicted, the last 15 months haven’t been plain sailing for TVR’s new owner. One of Smolenski’s first moves was to hire former McLaren director (and disappointed TVR bidder) Nigel Gordon-Stewart to help come up with a viable business plan. His strategy was based around a new state-of-the-art factory, outsourced body construction and an emissions-friendly V8 engine. Shortly after, Gordon-Stewart was sacked. He is now suing the company. While all this was going on, Smolenski was busy putting his own stamp on TVR. The first of which – announcing, via a company official, his intention to launch the company in North America – created a lot of concern. 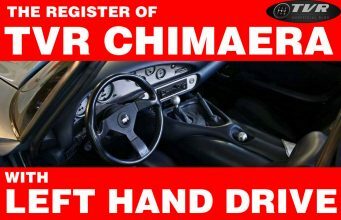 Selling cars as challenging to drive as these in a country as litigious as the US would be highly risky, the critics said. 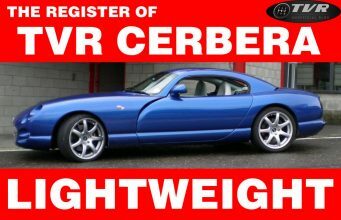 Tellingly, no mention of the matter has been made by any TVR spokesperson since. His second high-profile move spurred a different kind of response. 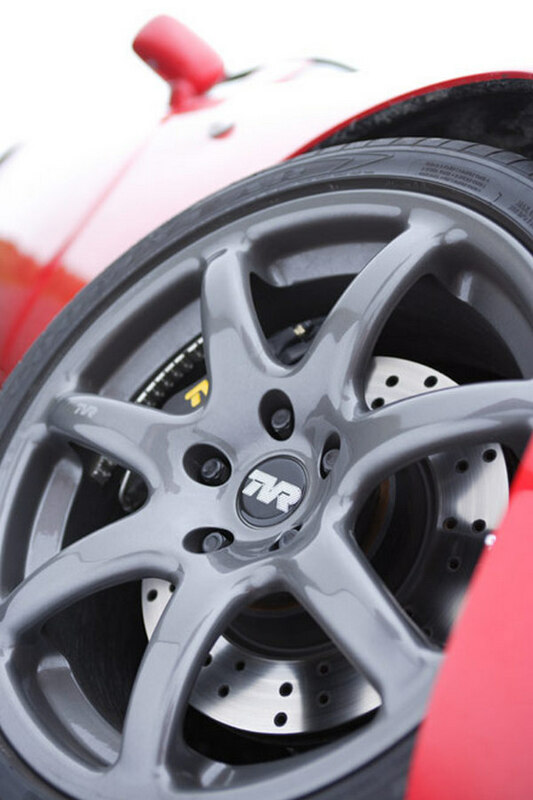 When he halted production and delayed development of the Tuscan 2 and Sagaris to establish more effective quality control procedures, a cry of “about time” came from the automotive community. 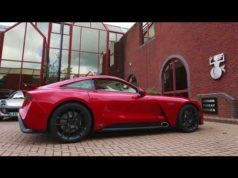 As cars were jetted to Africa and the Arctic for extreme-weather testing, it seemed that the young Russian was going to make good on his promise to sort out TVR’s reliability for good. 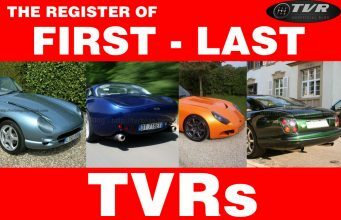 So, a little over a year later, where exactly is TVR? 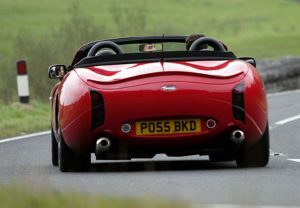 The best way to gauge how far Britain’s biggest-selling sportscar manufacturer has come since the buyout is to drive its latest model, the Tuscan Convertible. Note ‘Tuscan’ rather than Tuscan 2. This is the first time the car has been built in convertible form, the Targa being the closest you could get to wind-in-the-hair motoring. Like the coupe, the new car gets the revised twin-headlamp clusters instead of the old (much cooler-looking) triple lamp arrangement. No matter, it’s still a beautiful-looking machine – even more so because of the contrasting tones of the svelte black canvas roof, 18-inch gunmetal grey alloys and bright red paint. Creating a convertible is a complicated business. But even by today’s standards, TVR has gone the whole nine yards with the Tuscan. 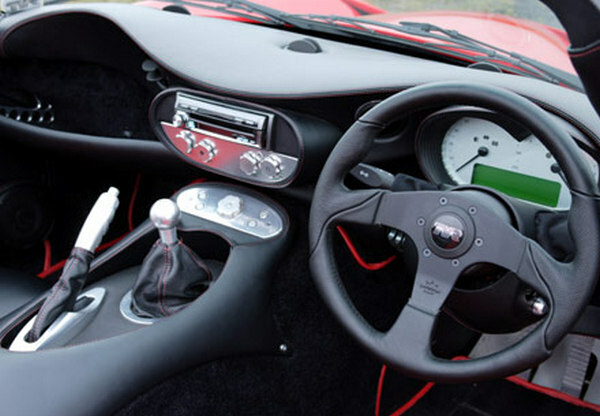 The interior is an absolute masterclass in modern sports car design and, significantly, is the first to feature a symmetrical dashboard layout. Not only will this dramatically reduce the cost of converting to left-hand-drive, but – along with moves such as the use of Ford Mondeo-derived indicator stalks in place of costly bespoke items – also underlines Smolenski’s determination to drive deeper into Europe. Don’t think that these small steps towards homogenisation have robbed the TVR of its character, though. The counter-rotating dial in the middle of the centre console that opens the doors is delightfully bizarre, while the Tamora-style instruments are side-lit with an eerie, yellowish-green glow. Then there are the leather seats. Hand-stitched with red thread and featuring striking red leather inserts, they combine with the organic curves of the dashboard and clamshell-style storage trays to create an ambience that’s part sci-fi, part French boudoir. It even smells other-worldly. In terms of ergonomics, ease of use and build quality, the Tuscan Convertible definitely raises the game. Sadly, the same can’t be said of the roof mechanism. 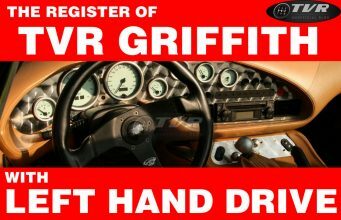 Smolenski was apparently keen to develop an electrically retractable system, but was swayed into using the tried-and-tested Griffith formula by the enormous cost and time involved. Shame. 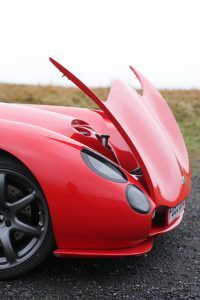 With practice, it’s possible to get the main roof panel in the boot and the hinged rear section down within a matter of minutes, but it’s not a task undertaken lightly. Work still needs to be done on the window seals, too. On my test car there was a gap between the roof and the glass big enough to poke a biro through – exactly the sort of thing that has traditionally sent potential buyers scurrying off to their nearest Porsche dealer. That and the plastic rear screen. With the roof down, though, minor niggles like these soon evaporate, subsumed as they are by the sheer visual drama of the thing. Even the most striking roadsters tend to disappoint once you get close enough to peer inside them. Not the Tuscan. It has the look and feel of a true bespoke sports car – the stuff of pure fantasy. The same goes for the exhaust note from those superbike-style carbon cans. The needle flicks violently around the rev range at each prod of the throttle, the 4-litre straight-six engine barking, growling and screaming like a cornered animal. 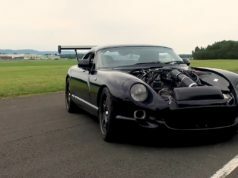 TVR decided to use a detuned version of the Sagaris’s engine rather than the Tuscan 2’s 3.6-litre unit – and a good thing too. 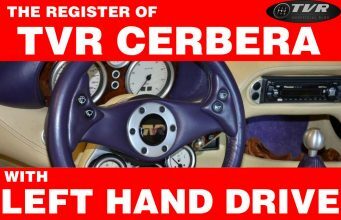 It’s one of the great sports car engines, providing that “anywhere, anytime” thrust that’s so central to the appeal of any TVR. All the while, that glorious soundtrack is reverberating off walls, trees and anything else left behind in the Tuscan’s wake. There’s a 400bhp Convertible S waiting in the wings, but to be honest the “regular” version feels more than fast enough. Some of this can be put down to the 365bhp that the engine kicks out at 6,800rpm; in a composite and aluminium car weighing just 1,100kg, that adds up to a power-to-weight-ratio of 337bhp-per-ton. However, much of the car’s ability to intoxicate can be put down to the sheer visceral nature of the thing. You can hear, feel, and even smell every movement of the car’s internal workings, as if they were hard-wired directly into your synapses. It’s not subtle; but then it’s not meant to be. One thing’s for certain, though: it’s a less physical experience than any previous TVR offering. 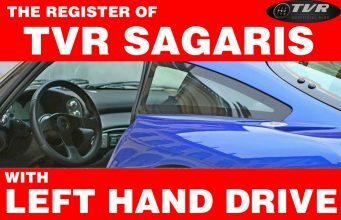 The clutch is light and wonderfully progressive; the gearshift precise but satisfyingly slick; and the lower-geared steering rack introduced on the latest coupe has done much to reduce steering effort at parking speeds. The suspension’s a revelation, too. 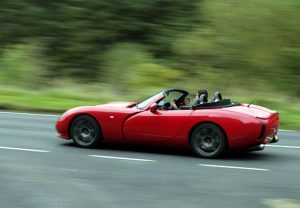 Damper manufacturer Bilstein and a chassis specialist called Multimac had a lot of input into the Convertible’s set-up; the result is the most finely resolved ride and handling balance yet. In sports setting (there’s also a comfort configuration) the ride is nice and supple around town, yet taut and well-damped at high speed. 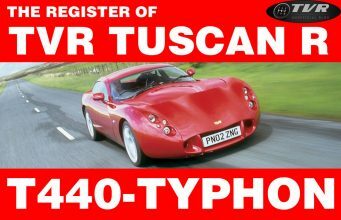 That said, there’s a slight dartiness over rutted, variable-cambered roads; the Tuscan is also still a car that you drive with both hands firmly on the wheel – especially during spirited cornering. The 235/55-profile Goodyear Eagle F1 tyres generate enormous grip and give plenty of warning before letting go. When they do, though, you need a strong constitution and quick reflexes to get it straight again. 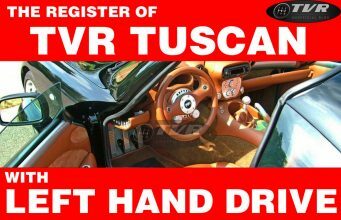 Of all the current TVRs, it’s the Tuscan Convertible that represents the most complete package. It has superb brakes, great traction, a gorgeous interior and does a fine job of insulating its occupants from wind, even at motorway speeds. It also has a very capacious boot, even with the roof panel stowed away. 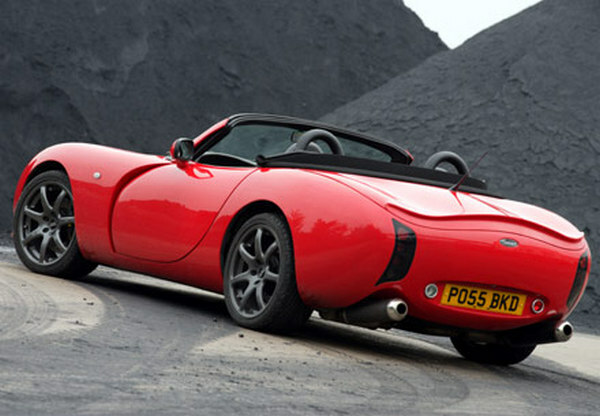 All that, and a claimed top speed of 190mph-plus, for a starting price of £39,050 (£45,061 in this spec). It makes you think – on more than one level. 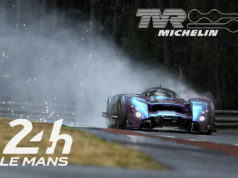 The concept is pure Peter Wheeler-era TVR, but the execution, while not quite perfect, speaks volumes about Smolenski’s commitment to opening the brand up to a wider audience. It’s going to be an interesting journey, and I, for one, am going to stick around for the ride. Great article. Love this car to bits! !